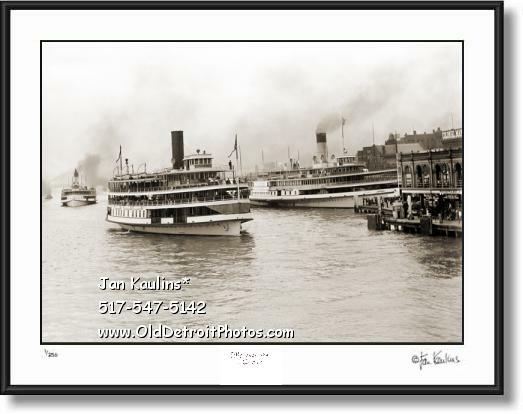 OLD VINTAGE DETROIT STEAMSHIPS BRITTANIA & GREYHOUND black and white photo picture print for sale. Thiis sepia toned OLD VINTAGE DETROIT STEAM SHIPS BRITTANIA AND GREYHOUND photo print is made from an original historic, circa 1910, restored original black and white photo. It is a wonderful image of of Great Lakes Steamer Brittania on The Detroit River passing by The Woodward Avenue Detroit Dock. At the dock is another beautiful Great Lakes Steamer The Greyhound and approaching in the distance is yet another magnificent Great Lakes Steamship The Owana. This photo gives the viewer some idea as to the majesty of these Great Lakes Steamers and to their popularity just after the turn of the last century.